The installation of a solar photovoltaic system often takes many years to achieve a full return on investment. Can homeowners with photovoltaic systems benefit from selling their home at a premium compared to non-solar homes? What does the future hold for this energy source? Figure 1. This roof showcases two types of solar photovoltaic systems: one standard solar panel (left) that sits on top of the roof, and the other mimicking the roof tiles (right). Courtesy of John Hritz, 2007, FlickrCommons. CC BY 2.0. As the residential solar market has seen rapid growth in recent years, costs have come down significantly.7 From 2010 to 2014, the cost of a typical solar panel system has declined by approximately 50%.9 Despite this, the cost of a residential PV system remains substantial. There are many factors that determine the cost effectiveness of installing solar panels.9 These include the initial cost of installation, a particular home’s solar availability, federal and state incentives, projected electricity use, and home sales price.9 Some of these factors can be calculated or estimated with some degree of certainty.9 The home sales price, however, is one factor for which there has been limited knowledge. Until recently, there had not been extensive research on this topic, therefore, this factor has been difficult to gauge in analyzing the cost effectiveness of a residential home photovoltaic system. This is an important issue because homeowners may not be able to count on getting a good return on investment through lower electricity bills. This could occur if an individual buys a newly-built solar home or installs panels on an existing home, and then has to move out of that home in a short period of time. Figure 2. 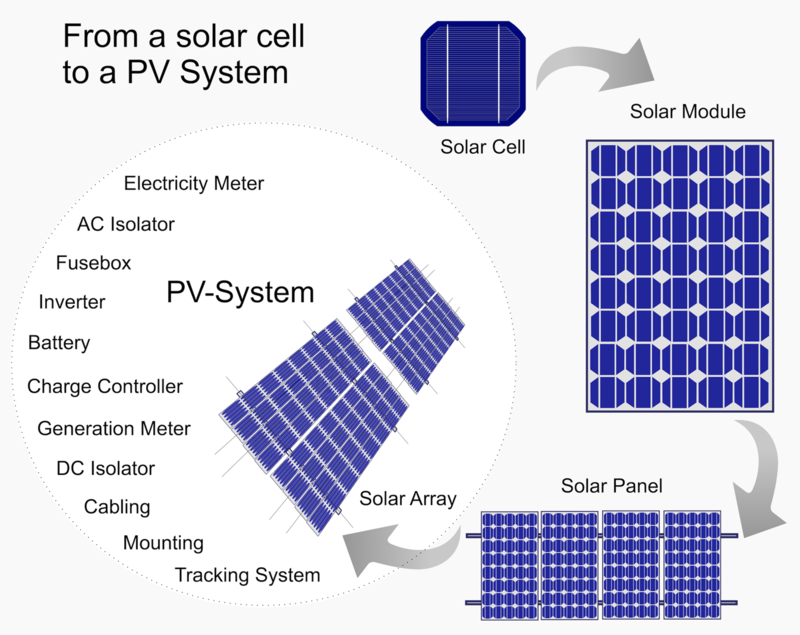 Diagram of common components of photovoltaic systems. Courtest of Rfassbind, 2014, Wikimedia Commons. Public Domain. Figure 3. The Department of Energy introduced the SunShot program in order to make solar energy implementation more affordable. The initiative aims to reduce the cost of solar technologies by 75% by 2020. While studies initially focused on select states, research is quickly spreading throughout the US as photovoltaic systems become competitive in a broader set of markets. Courtesy of the U.S. Department of Energy, 2012. Public Domain. Figure 4. The time required to install a solar photovoltaic system depends on the size of the project itself. However, most projects can be completed within 1-2 days, making solar installation a relatively quick process. Depending on the specifics of the PV system that is installed in an individual’s home, a sizable return may be seen. Courtesy of skeeze, 2016, Pixabay. Public Domain. In the last several years, there has been a tremendous amount of knowledge gained regarding solar panels and their effect on home values. Overall, homeowners should be able to see a sizable return on their solar investment depending on the specifics of their PV system. If one owns a solar home and resides there for many years prior to selling, the premium might be somewhat reduced due to the age of the PV system, but the homeowner likely would have had substantial savings from multiple years of reduced electricity bills. However, if one installs solar panels and then decides to move after only a few years, then there would have been less time to accumulate electricity bill savings. Fortunately, the sale price premium would likely equate to the investment cost since the PV system would be relatively new. In either scenario, the homeowner will likely see a decent return on investment. The current research supports this notion and can help individuals make informed decisions in the residential marketplace. Dastrop, S., et al. (2010, December). Understanding the Solar Home Price Premium: Electricity Generation and “Green” Social Status. University of California Center for Energy and Environmental Economics Working Paper Series, E3 WP-001. Dinan, T. & Miranowski, J. (1989). Estimating the implicit price of energy efficiency improvements in the residential housing market: A hedonic approach. Journal of Urban Economics, 25(1): 52-67. Hoen, B., et al. (2011, April). An Analysis of the Effects of Photovoltaic Energy Systems on Residential Selling Prices in California. Lawrence Berkeley National Laboratory. 1-46. Hoen, B., et al. (2015). Selling into the Sun: Price Premium Analysis of a Multi-State Dataset of Solar Homes. Lawrence Berkeley National Laboratory. 1-33. Horowitz, M. & Haeri, H. (1990). Economic efficiency v energy efficiency. Energy Economics, 12(2): 122-131. Nevin, R., et al. (1999). More Evidence of Rational Market Values for Home Energy Efficiency. The Appraisal Journal, 67(4):454-460. Schiermeier, Q., et al. (2008). Electricity without Carbon. Nature, 454:816-823. U.S. Department of Energy, SunShot Vision Study. (2012, February). Retrieved from https://www.energy.gov/sites/prod/files/2014/01/f7/47927.pdf. Department of Energy, SunShot Vision Study. (2012). [United States map of PV coverage]. Retrieved from https://www1.eere.energy.gov/solar/pdfs/47927.pdf. Hritz, John. (2007). 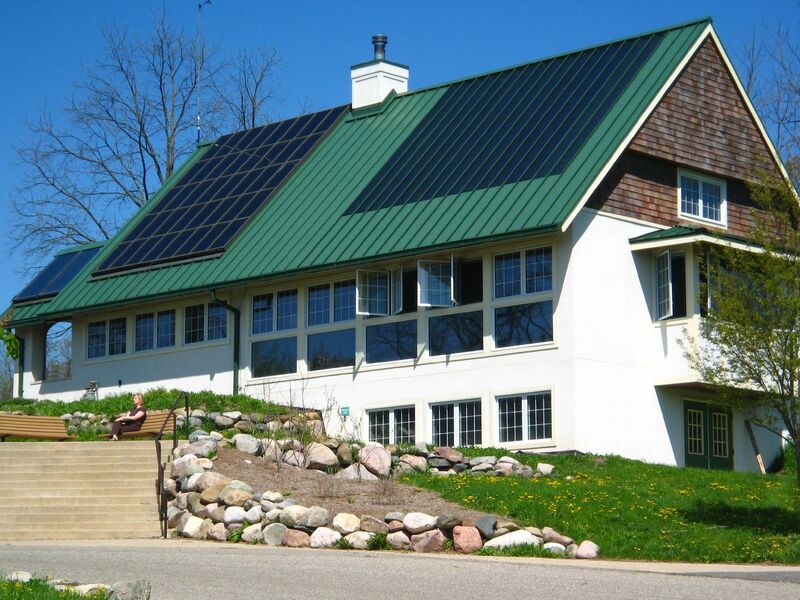 [Photograph of house with solar panels]. Retrieved from FlickrCommons. CC BY 2.0. Rfassbind. (2014). [Diagram of the possible components of a photovoltaic system]. Retrieved from Wikimedia Commons. Public Domain. skeeze. (2016). 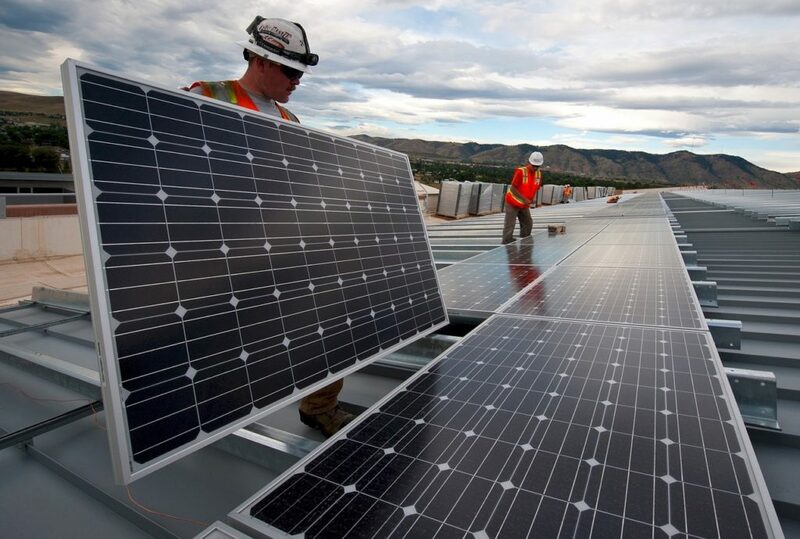 [Photograph of solar panel installation]. Retrieved from Pixabay. Public Domain.